Scorpio The Scorpion, © Anne Nordhaus-Bike. Available as mugs, pillows, throw blankets, ceramic tiles, posters, blank cards, and birthday cards. All gifts can be customized – visit our online art store now to see all these beautiful gifts. 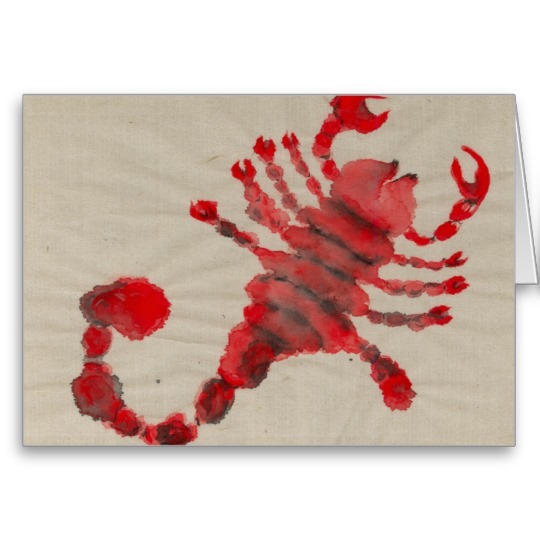 This passionate painting captures Scorpio’s symbol, the Scorpion, in this sign’s trademark colors, crimson and black. 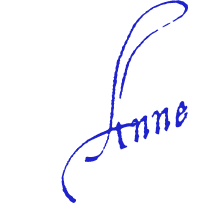 It was created with an exquisite premium handmade watercolor paper. 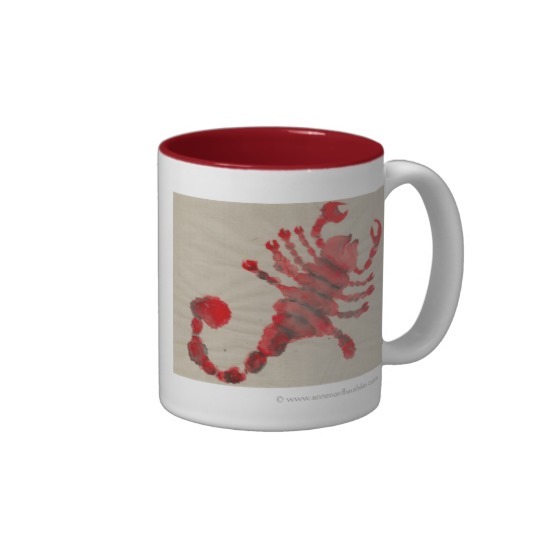 AVAILABLE AS: mugs, pillows, throw blankets, ceramic tiles, posters, blank cards, and birthday cards. All gifts can be customized – visit our online art store now to see all these beautiful gifts. Visit our online art store now! 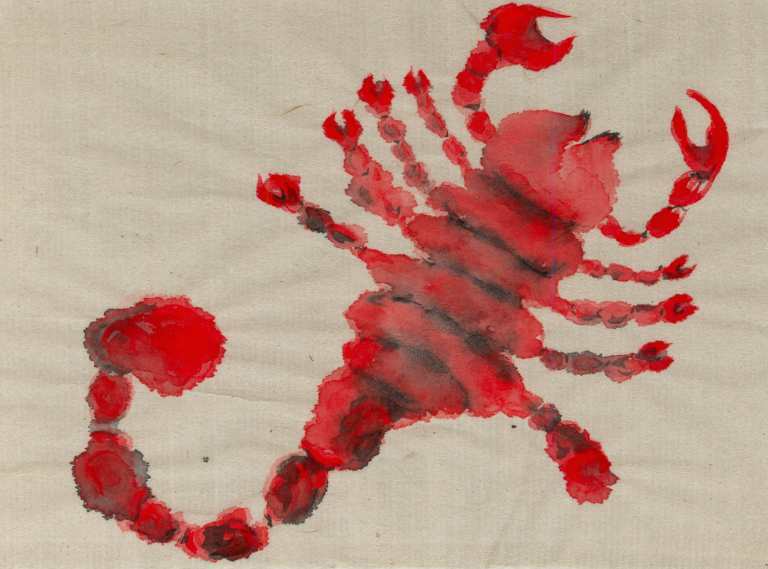 This Scorpio The Scorpion symbol is one of 12 watercolor paintings made for the astrology book Follow the Sun: A Simple Way to Use Astrology for Living in Harmony. 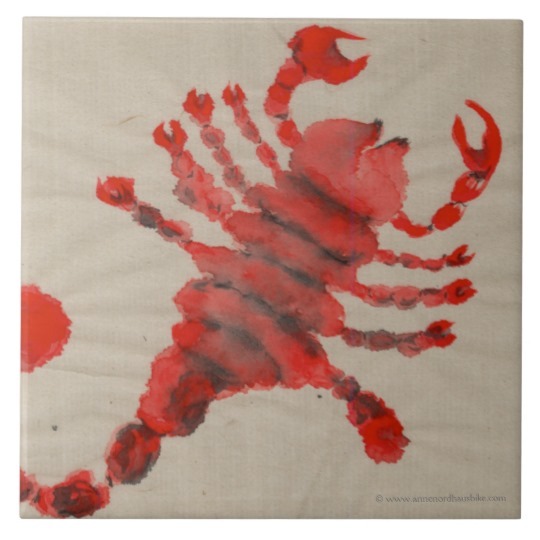 It shows a red and black scorpion, filled with this sign’s intensity and color. The scorpion’s pincers can reach out to life’s adventures, but its tail is ready to sting if provoked. It carries this sign’s deep endurance along with its passion, and you’ll find this design helps inspire you to keep passion in your life, too. 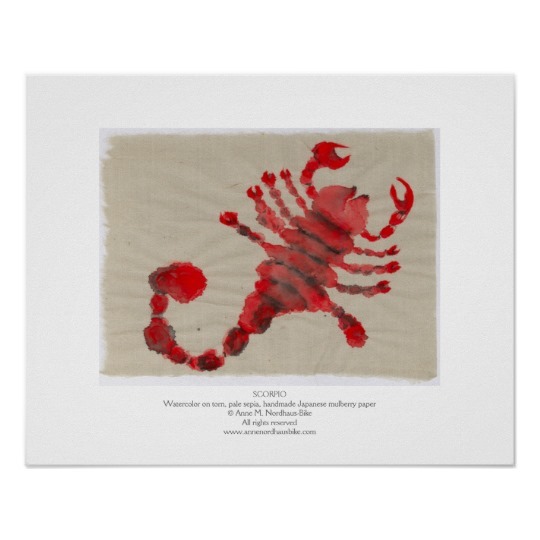 This Scorpio The Scorpion image is available as beautiful gifts in our online art store. All gifts can be customized: add text such as your name, zodiac sign, or a special message, or adjust images and add background colors. Also, most gifts come in a many different sizes, shapes, and styles: seven mug styles, six pillow sizes with two fiber options, two ceramic tile sizes, four paper and canvas options for posters, and three card sizes. See individual product pages for full details. This beautiful painting combines art and astrology to help you enjoy living in harmony. 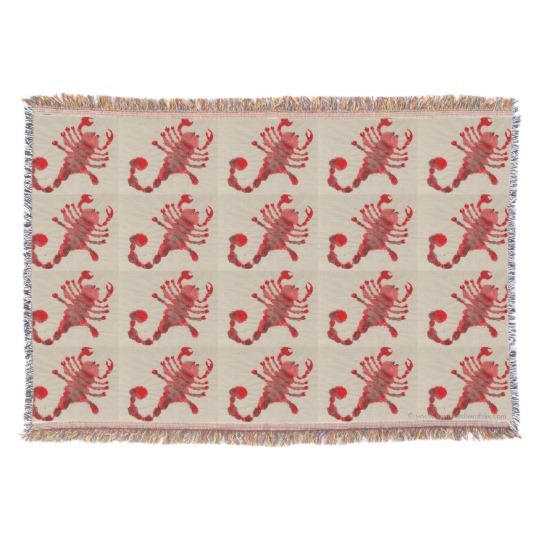 Click any of the images or the yellow buttons here to see all the lovely gifts we offer based on the Scorpio The Scorpion painting. And keep in mind: you can make these gifts your own, because all our gifts can be customized! Remember: when you choose art based on your zodiac sign, you strengthen your astrology and help connect with who you really are and why you’re here. 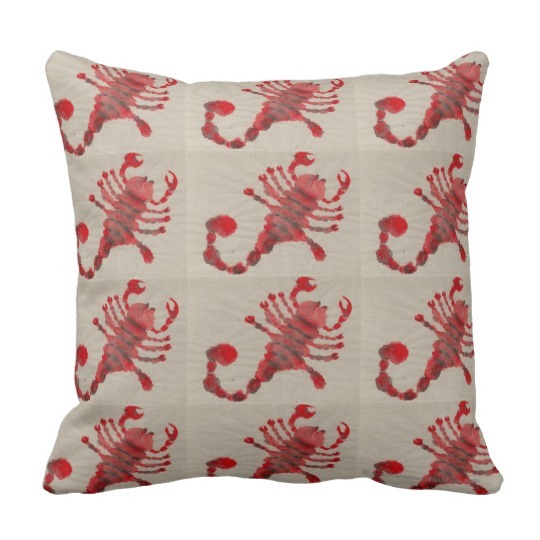 And when you give a loved one or friend a zodiac art gift, you help others do the same.